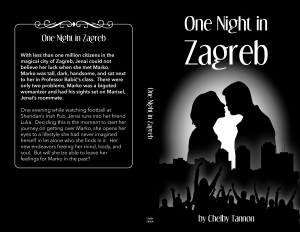 With less than one million citizens in the magical city of Zagreb, Jenai could not believe her luck when she met Marko. Marko was tall, dark, handsome, and sat next to her in Professor Babić’s class. There were only two problems, Marko was a bigoted womanizer and had his sights set on Marisel, Jenai’s roommate. One evening while watching football at Sheridan’s Irish Pub, Jenai runs into her friend Luka. Deciding this is the moment to start her journey on getting over Marko, she opens her eyes to a lifestyle she had never imagined herself in let alone who she finds in it. Her new endeavors freeing her mind, body, and soul. But will she be able to leave her feelings for Marko in the past? Chelby Tannon is my pen name. I work in the public sector and have raised 4 girls. I enjoy hiking the trails of Roxborough Colorado and going to Bear Creek Lake Park to paddle board and kayak. I have currently written and published one book. I am working on my second with the intent of a third. I made the decision to start writing as a form of therapy and it has blossomed into a real passion.